Lead The Field. Live Life Your Way. What Does A Balanced LIFE Feel Like to You? Over the course of just 120 days. the growth and success in your life. because you can’t wait to start your day. You feel alive and happy and on purpose. You might even feel a sense of giddiness because everything is falling SO neatly into place … everything is working with this crazy kind of methodical magic in your life . . . And it’s because your brought this program, Lead the Field, into your life. I’m Not Claiming That A 12-Lesson Audio Coaching Program Can Be Responsible For Dramatically Changing Your Life…YOU ARE! The fact is, YOU have always had a powerful, limitless mind. Every person on this planet has a powerful, limitless mind. You’re Probably Not Living The Life You Deserve. When you make a commitment to this Lead the Field coaching program, you’re going to find that any aspect of your life CAN and WILL blossom! Lead the Field is often labeled a “goal achieving” program. That’s like saying the sun is just a star in our solar system. to living life on your terms. It’s from this essential foundation that you’ll begin to learn how to implement the REAL and TRUE seeds of success … seeds that are rarely taught anywhere in the world, but are capable of effortlessly growing rain forests of lush success in your life. Every 10 days it’s a new lesson. And, as you devote 10 days to each lesson, you’re going to find that you’re learning something new each of those days. 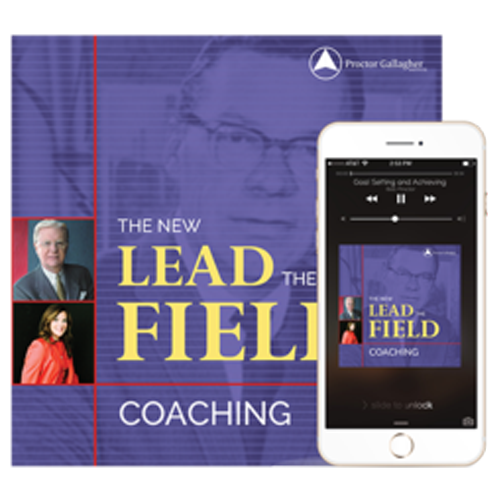 Lead the Field will become your reference and resource for the rest of your life. It’s that powerful. The first and most important secret that will change your life in a week. – Uncovering hidden opportunities in your life right now. – Easily recognizing and solving the problems that stand between where you are now and the point you wish to reach. – The 3 unfailing factors that work together to move you to that better position in life. – Honing in on, and charting your course for “The One” goal (and why). – Understanding the mechanics of your mind that slam the door to your greater success. – Tapping into the infinite mental powers of your own mind. – Finally bridging the gap between where you are and where you deserve to be. – The (mind-blowing) one-hour-a-day exercise that vastly improves and leverages every action you take. – Understanding the Universal Laws – and the Principal Law – that sees you getting rich with mathematical certainty. – Implementing the “Apothecary Scale” to completely eliminate nagging worries, confusion and fear. The 3 bases of success that no one but your Sunday School teacher may have formally taught you. – The unfailing boomerang of ongoing failure or ongoing success. – Truly understanding, recognizing and steering clear of the slippery slope of compromise. – Moving out of mass thinking and non-motivation with this specific action. – The Seven Levels of Awareness – where do you currently reside and where do winners reside? – The 3 simple steps to breaking through the thorny barrier of conformity. – Setting up your Y.O.U. corporation so that you’re earning all the money you want and living the life you’ve always wanted to live in three years or less. – THE one “trick” you’ve always had up your sleeve that will turn your life on a dime! – Increasing your effectiveness from 50% to 100% in 30 days or less. – The only 3 aspects that determine how much money you will ever earn. – The two distinct steps you must take to earn all the money you want. – Setting your money goals: Which group do you fall into? – The only 3 strategies for earning money (and the one that is, by far, the fastest route to take). The unfailing (almost unbelievable) correlation between this one item and executive level salaries. – One of the most extraordinary lessons you will ever learn: Turning the task of time management on its head with The $25,000 Secret. – Seven simple implementations to create day-after-day success. – Are you following a follower or following a leader? – The single sentence that will open doors for you everywhere. – The one action that develops lasting, lifetime security for you. – Practices that establish your leveraged effectiveness as a leader (including your own home). – The 9-step mental process of “selling” any idea to anyone (you will be surprised at what these steps actually are). Within 15 minutes of registering for this program, you will have your own personal login to the Proctor-Gallagher campus, and the first audio lesson in your “in” box! We know it takes new dedication and effort to initially start this daily program. It’s why we’re connecting you with the entire global community of fellow “students,” along with answers from me and my New Lead the Field experts in an easy-access community. Every 10 days, we send you a new audio lesson with the downloadable transcript to follow along. Sandra Gallagher and I have created introductory and mid-point videos that summarize key lessons, point out hidden contexts you want to look for, and offer real-life examples and suggestions to enrich and accelerate your learning. Find Your Way To The Winner’s Circle. Aren’t You Ready to Live Life Your Way?